Pacific Rim Cobalt Corp. is a Canadian-based exploration company focused on the acquisition and development of production grade cobalt deposits, a key raw material input for the growing lithium-ion battery industry. 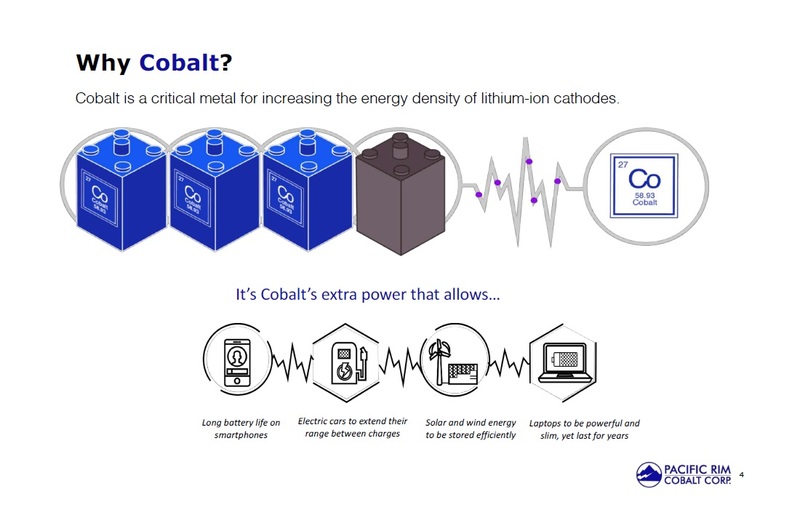 Cobalt is the next investment trend as a critical component of lithium-ion batteries. Cobalt is currently in a global supply deficit, has a vulnerable supply chain, and is an emerging sector with extraordinary potential. 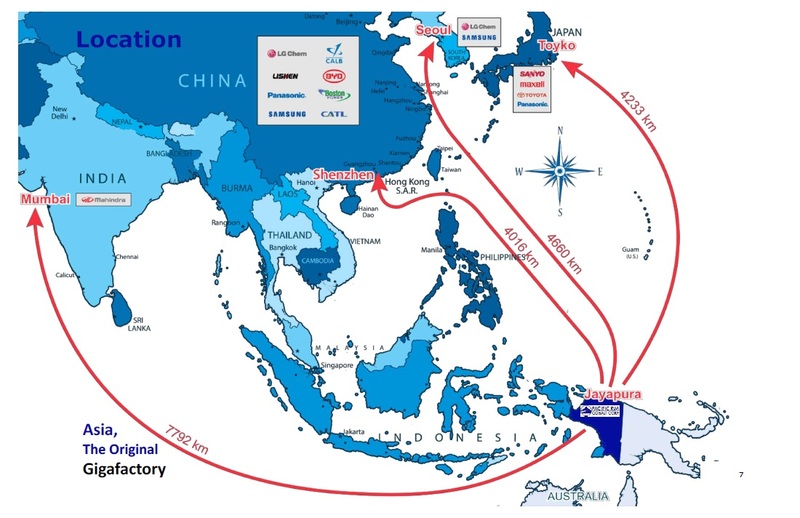 The Company’s 100%-owned flagship Cyclops nickel-cobalt project in Indonesia is strategically located near China, the world’s largest cobalt buyer. Indonesia is one of the world’s largest sources of nickel. Cobalt is a byproduct of nickel; Indonesia has the potential to be a leading supplier of nickel and cobalt for the EV Battery sector. Pacific Rim Cobalt is poised to leverage the global shift from fossil fuels to renewable energy. 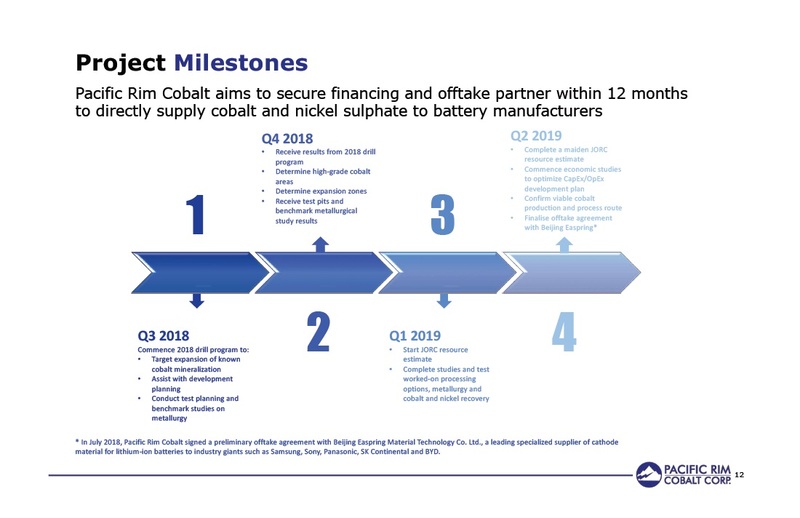 On January 8, 2019, Pacific Rim Cobalt provided an update detailing the milestones and growth initiatives accomplished throughout 2018 and strategic goals for 2019. During 2018, the Company's primary objectives included exploration of its Cyclops nickel-cobalt project. Throughout 2018, company representatives conducted extensive community consultation with local stakeholders, as well as regional government officials. These discussions resulted in overwhelming support for the Company's plans to advance the Cyclops project. In particular, finalization of the necessary agreements to access northern areas of the Cyclops project containing the majority of the historically identified mineralized zones was achieved. While awaiting access, the Company was able to complete topographic and photographic surveys, mapping, sampling, and a mini-bulk sample within the mineralized zones. The Company also conducted a small-scale program in the previously unexplored far southern area of the site, which yielded continued, yet reduced, mineralization. In November 2018, Pacific Rim Cobalt announced strong results from a mini-bulk sample at the Cyclops project. The promising results bolstered the Company's long-held views that the shallow nature of the mineralization lends itself to low-cost, logistically straightforward drilling. The Company is currently drilling and extracting additional mini-bulk samples for further metallurgical testing. During July, 2018, Pacific Rim Cobalt entered into a preliminary offtake agreement with Beijing Easpring Material Technology Co. Ltd., a leading specialized supplier of cathode material for lithium ion batteries to industry giants such as Samsung, Sony, Panasonic, SK Continental and BYD. In July 2018, the Company engaged an extractive technology and mineral process development partner to assist in selecting the optimal process for recovery of cobalt and nickel from laterite material. The results of initial scoping tests demonstrated the consistent effectiveness of the Company's processing partner's leach technology in the extraction of value elements from the laterite samples tested. 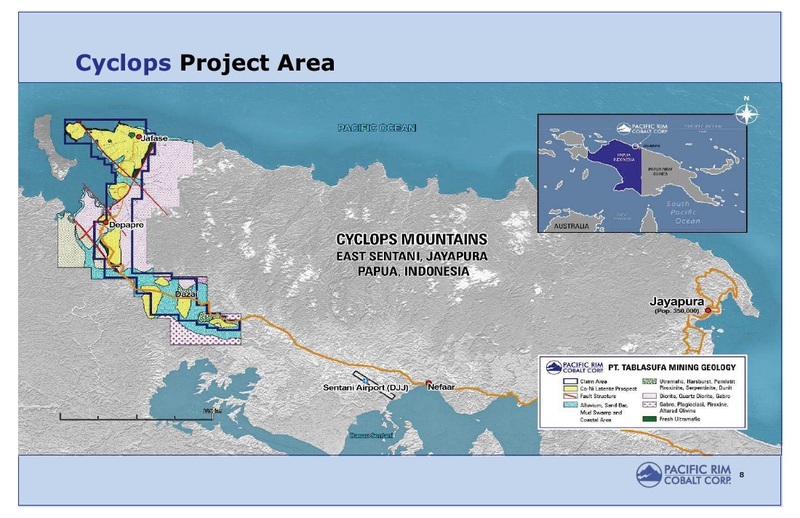 In June 2018, Pacific Rim Cobalt established an operations office in the capital city of Jayapura and a field operations facility in Sentani, located 40 kilometres and 15 kilometres from the Cyclops project, respectively. The Company also announced the opening of a business development office in the Jing'an commercial district of Shanghai. The Company aims to complete its maiden NI 43-101resource estimate at Cyclops, finalize studies and testing on processing options, undertake economic studies to optimize its development plan, confirm the optimal processing method for the site’s resources and commence formal negotiations with Easpring in relation to a binding offtake agreement for nickel and cobalt sulphates. The Company is excited about the work ahead, assured in its ability to continue meeting its key developmental milestones and confident in its capacity to create outstanding long-term value for its shareholders. Mr. Sundher is the President of Canrim Ventures Ltd., a Singaporean advisory firm specializing in early stage project finance and structure and has raised over $40 million for companies in which he was a founder/partner. Mr. Sundher has over 20 years of capital markets experience and has developed and sold several successful private and public companies. Previously founded Indogold Exploration, a Jakarta-based mining service firm. Mr. Vanry has 25-years professional experience in senior management positions with public and private natural resources companies, providing expertise in capital markets corporate finance, mergers and acquisitions, regulatory compliance, accounting and financial reporting. Mr. Talaska has over 30 years of experience in the mining and exploration industry. He has held senior positions with several companies both in Australia and South East Asia. In these roles he has extensive experience in project identification, open pit and underground mining, value adding and optimizing of mining operations and management of geological teams in the production and exploration environment. The above included the sourcing of cobalt rich ore suitable for direct feed to the Kambalda Nickel Smelter and led to the discovery of multiple Ni-Co laterites including the Bulong Ni-Co project. Mr. Juffry is a Chemical Engineer and Extractive Metallurgist by background training and experience with over 20 years of experience in the Indonesian mining and minerals exploration field. Mr. Toto is a Mining Engineer with over 15 years experience in Indonesian project assessment, development and operations. Mr. Johnston is President and Chief Executive Officer of Desert Lion Energy. Mr. Clark is the Executive Director of the Ontario Prospectors Association (OPA). Mr. Bromley works in corporate finance at a boutique merchant bank. He is currently a Director of White Gold Resources. Mr. Fielding is Chairman of Wealth Technology Limited. On April 01, 2019, Pacific Rim Cobalt Corp. has released results from its continuing 2019 drilling program at its flagship Cyclops nickel/cobalt development project, Indonesia. Drilling continues to confirm shallow intersections from surface with elevated cobalt up to 0.25 per cent in the limonite zone and nickel values of 1.91 per cent in the underlying transition and saprolite zones. A total of 29 holes for a total of 402 metres have now been completed. On March 21, 2019, Pacific Rim Cobalt Corp. has provided business update. The Company has provided a Cyclops nickel/cobalt project development update, its next steps and a battery metal market commentary. The Company reported drilling as well as mini-bulk sample results indicating strong mineralization occurring from surface with nickel values of up to 2.65% and 1.78% respectively and cobalt of up to 0.24% and 0.16% respectively. The drill and mini-bulk sample results are both consistent with data which formed the basis of the Historical Estimate1 for the Project. The Company continues to receive results from drilling which it expects to disclose regularly through the balance of 2019. Approximately 15% of the planned Phase 1 and Phase 2 drilling programs for the year have been completed with approximately 50% of holes drilled having been assayed and made public. To date drilling has been focused on an area of the project which covers ground peripheral to the main laterite zone of interest and over which historical exploration was carried out. This drilling is currently delineating the north east boundary of this zone and will progressively expand into the primary areas during the remainder of calendar 2019. Current drilling is yielding strong results and is expected to continue throughout the program. Additionally, the Company aims to complete its maiden resource estimate at Cyclops in accordance with National Instrument 43-101 Standards of Disclosure for Mineral Projects, which together with results of testing on processing options, will allow consideration for economic studies to optimize development of the project. 2019 may also mark commencement of formal negotiations with Beijing Easpring Material Technology Co., Ltd. in relation to achieving a binding Offtake Agreement for nickel and cobalt sulphates. The Companies are currently party to a Preliminary Offtake Agreement signed in July 2018. 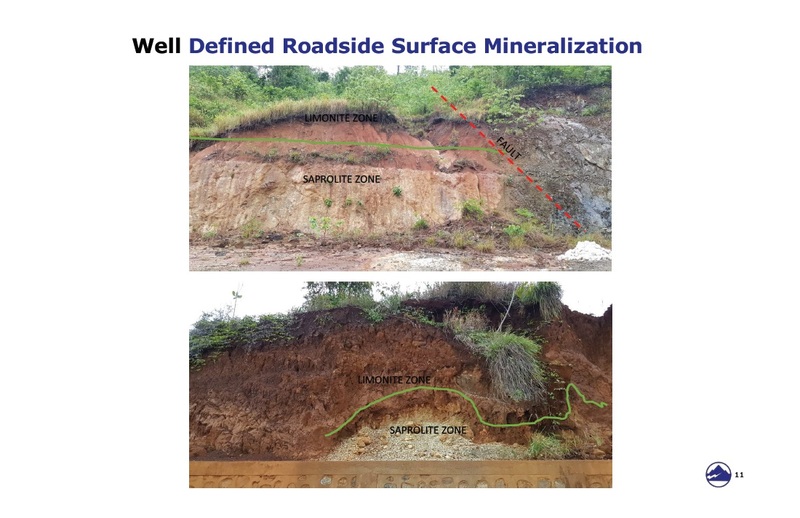 On March 5, 2019, Pacific Rim Cobalt Corp. has released assay results from the continuing 2019 drilling campaign at the Cyclops nickel/cobalt project, Indonesia. New shallow drilling returns discovery of strong nickel and cobalt mineralization. Pacific Rim drills 6 m of 2.28% Ni at Cyclops. Indonesia to decide on electric car policy with Hyundai keen to invest in a plant in the country (January 14, 2019). 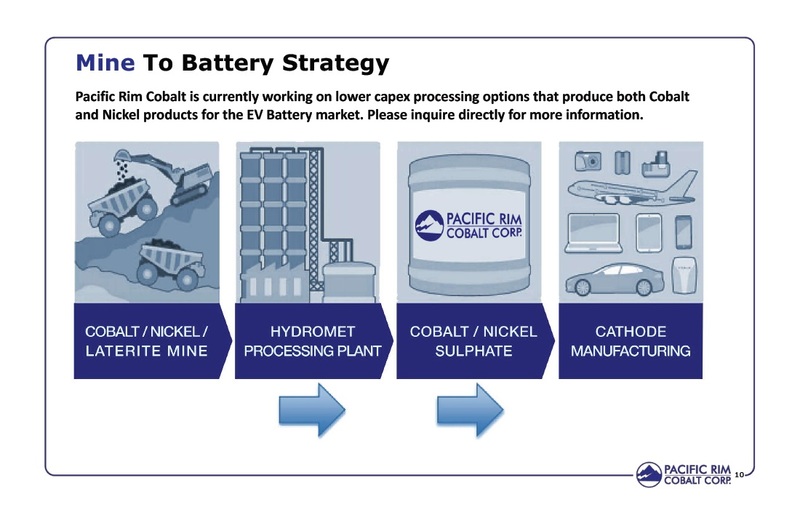 On January 8, 2019, Pacific Rim Cobalt Corp. provided an update detailing the milestones and growth initiatives accomplished throughout 2018 and strategic goals for 2019.